As a person, I tend to not revisit old practices. I don’t watch many old movies. I still check out new music. Heck, I don’t even get excited about retro video games. In vaping, though I never forget my roots, I left mouth-to-lung (MTL) devices behind a long time ago. But thanks to the Innokin Ares MTL RTA, I found a whole new appreciation for this style of vaping, and a new go-to atomizer for pure flavor. 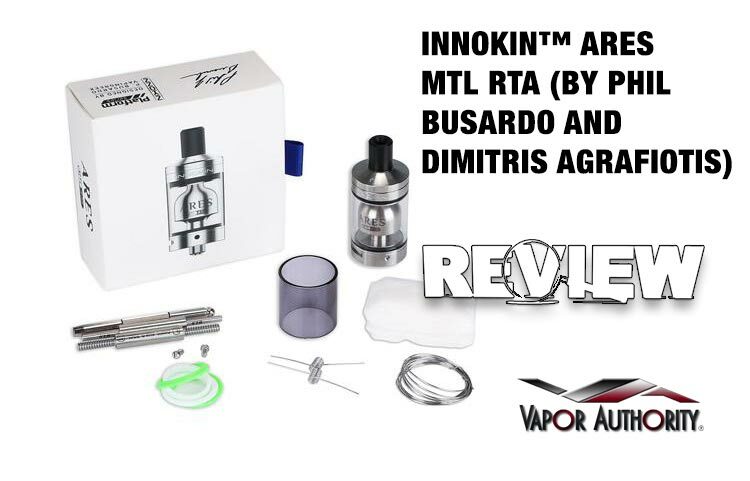 The vaping personalities behind the new Innokin Ares – Phil “PBusardo” Busardo and Dimitris “The Vapin’ Greek” Agrafiotis – may be dedicated MTL enthusiasts, but truth be told, you don’t even need to be a fan of MTL vaping to appreciate the flavor and quality this rebuildable tank atomizer brings to the table. Let’s dive in and take a closer look at the Innokin Ares to see why my mind changed quite a bit over the course of a few weeks. Innokin has always impressed with its dedication to top-tier packaging, and the Ares is no exception. On the outside, sharp graphics and clearly translated English make the product’s features easy to understand. But on the inside – yes, even with a black and white image of Phil and Dimitris staring back at you – Innokin has raised the bar for professional, mature presentation. Inside the box, you’ll find the Ares MTL RTA itself, two pre-wrapped coils, a wide range of colored o-rings, additional wire, extra screws, organic Japanese cotton, and a pair of separate coil jigs – each representing the preferred build tools used by the vaping heroes on the box. But not only are these items included, they’re packaged in sealed, protective sleeves with clear labeling on each for the items within. And, in a nice touch, there is also an included QR code for additional video instructions to help all levels of vapers maximize their experience with the Ares RTA. It’s a tremendously elegant offering, and a model for other companies to follow. The Ares itself is an interesting tank. 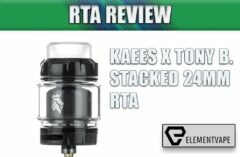 Though listed as an RTA, the deck is elevated, much like what we old-timers used to refer to as a Genesis Tank Atomizer (GTA), complete with large wick slots that can visibly hang below the deck openings, in full view of the glass, should you choose to build this way. One nice inclusion is the sloped, “bell-like” chamber cap, which narrows until it can connect with the already slim chimney section. This combination allows for a nice amount of vapor to concentrate as it travels smoothly toward your mouth. Is it revolutionary? No. Does it create strong, richly flavored vapor? Absolutely. The rest of this “old-school” tank has some decidedly “new” features. A sliding top-fill cap has a wide fill port, with a satisfying “click” that keeps it open without springing back while injecting e-liquid. And the 24mm width means it won’t look out of place on today’s more robust devices. Additionally, the versatile dual airflow control ring allows users to vary between ultra-tight, all the way to a wide-open setting that practically allows for restricted lung vaping. I tested all settings, and found that the tightest two settings were most akin to a traditional cigarette, without being overly snug. But, my wife, who is a full-time MTL vaper, actually found all settings to be looser than she expected, especially coming from two dedicated MTL enthusiasts. She also indicated that the curved mouthpiece (one of two included in the kit) tightened up the draw a little further, bringing the experience closer to a traditional smoking experience. Is it as tight as the recently reviewed VandyVape Berserker? Not even close. But a setup like this fills several gaps for different types of vapers. Taking apart the Ares reveals an absolutely beautiful, user-friendly, single-coil build deck. It’s a straightforward two-post design that is perfect for new builders, simply because there’s no trimming or tinkering necessary until after the coil is seated. And, with a side-screw, open-top format, your coils should slide right into the generous terminals. In fact, that’s exactly what happened using the prebuilt coil included in the package. I placed it, turned each screw four times, snipped and wicked. It was about as effortless as coil building could be. Though the included build tools allow for 3.5mm coil diameters, I found 3mm to be the sweet spot here. Though there’s ample room for a larger coil, I found the smaller, more concentrated build to improve flavor dramatically by comparison. My 2.5mm test coil also worked well, but the cotton seemed to choke a bit with the smaller diameter. Also, I imagine creative coil artists will try to get multiple coil builds into the Ares RTA, but again, I’d recommend against it. The deck is designed for simple, no-nonsense coils, and I found it best to use it as intended. As mentioned above, though the Ares MTL RTA can accept longer wicks down to the bottom of the chamber, I found my best wicking came from snipping the cotton tails just below where they stick out of the build deck. I tried a number of different wicks, and found the juice flowed best with minimal cotton in the way – just enough to cover each opening. Of course, this worked best for sporadic bursts of chain vaping for testing. Under more normal circumstances, longer wicks might work better. Your mileage may vary (and probably will). But these decks offer a lot of versatility, so experiment to find the wick that works best for you. One final note about the tank section – the 4mL capacity is absolutely gargantuan for an MTL tank. When used at lower wattages, on a higher-ohm build, with thinner, higher-nicotine e-liquid, I can imagine an MTL vaper getting more than a day out of each fill … even if they vape heavier than normal. 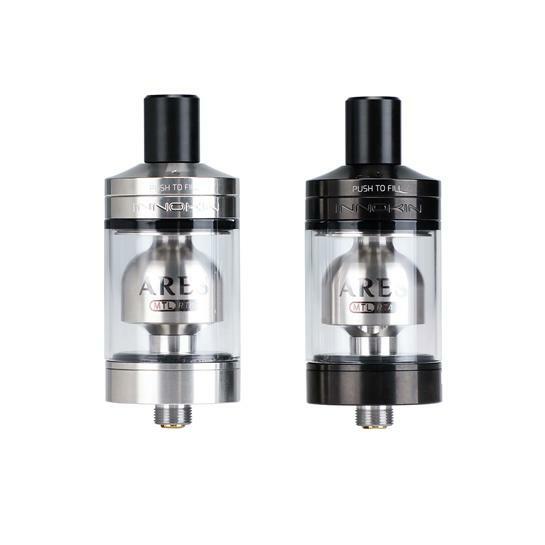 Considering this tank was designed in part by two well-known vape reviewers – each of whom has access to countless high-end tanks and atomizers, it’s no surprise that the Ares vapes extremely well. What IS surprising is how well it vapes for such a minimal price point. Starting with the included 1.0-ohm prebuilt coil, I wicked and juiced with a 6mg, 50/50 blend e-liquid, then tried it on my beloved Wismec Ravage. 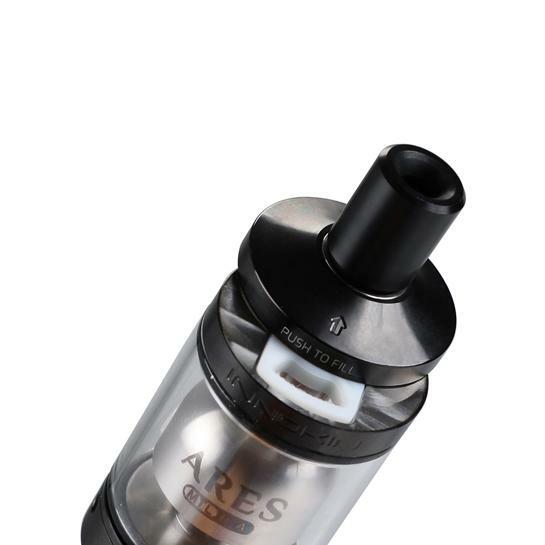 After just a minute of soaking, the Ares offered up surprisingly thick vapor, even at just 20-25 watts. Though the vape itself was cool, the flavor was rich and concentrated, with just the right balance of bite from the higher nicotine level. I then tried to move to higher resistance kanthal coil, lowering the wattage to just 15 watts. Here, I found the build ramped well, if not a little too quickly. But, for seasoned MTL fans, this is a likely sweet spot that offered the same rich flavor, and cool mouth feel. I decided to move next to a temp control build, using Ni200 wire, at a much lower resistance of 0.2 ohms. Even the thinner-gauge nickel seated well in the Ares’ massive terminals, and I had no issues setting and locking resistance in TC mode. At higher temps, I did notice the much higher ramp-up requirements and narrow chimney did lead to short bursts of initial heat when firing, but the Ares quickly caught up and didn’t look back. Higher temperature/wattage vaping isn’t an ideal use of the Ares in my opinion due to the tighter chimney, but it nonetheless performed without fail. My favorite coil to use on the Innokin Ares MTL RTA was one I built myself, using the spare wire included in the box. Reading at 0.75 ohms, with the airflow opened all the way, I managed to vape the Ares as both an MTL and restricted lung hit device, at a reasonable 30-35 watts. Here, I found a perfect balance of tighter smoking-like draw, and the warm, voluminous vapor I am used to from my everyday vape. And even under these conditions, the flavor never failed to impress. While some draws might have gotten too warm for some, I was floored by how well the Ares continued to produce flavor, even with the snug chimney section. 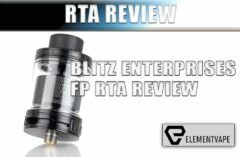 While I would be reluctant to call the Ares a “multi-purpose” atomizer, it certainly has enough flexibility to be appreciated by more than just die-hard MTL vapers. 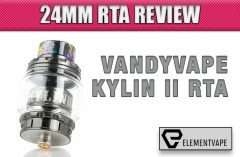 Innokin, alongside two of the most trusted names in vape reviews and advocacy, has developed a product with a near universal appeal, simply by how flavorful the resulting vapor is, from virtually any type of single-coil build. Sure, I can imagine dyed-in-the-wool MTL enthusiasts questioning the somewhat looser draw of the Innokin Ares MTL RTA. 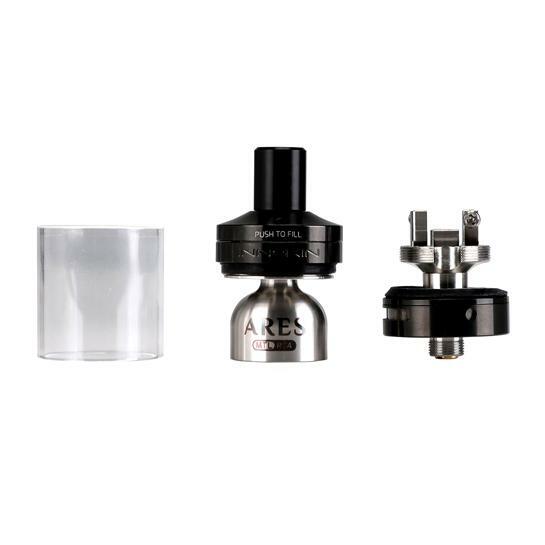 But its deep flavor, rich vapor, and ease of use make the Ares a no-brainer for vapers looking to remind themselves of the products and practices that got them into vaping in the first place.